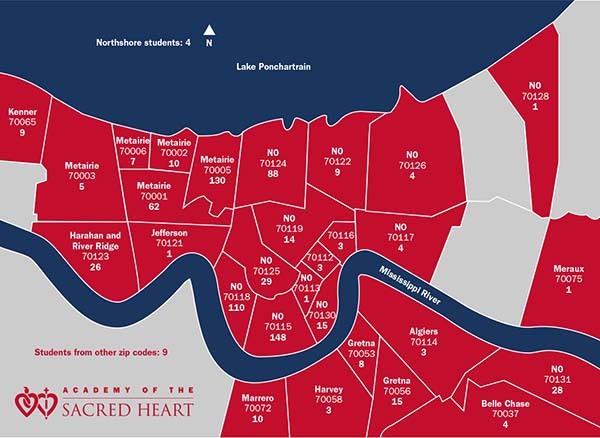 Sacred Heart girls come from all over the Greater NOLA. Mandeville, Destrehan, Chalmette, LaPlace – we never know where our future Sacred Heart girls will come from. But if something tugs at their heart, calling one to make change in the world, we're ready to meet her. Headmistress: Sr. Melanie A. Guste, RSCJ, Ph.D.
Other frequently asked Sacred Heart questions. Generally, 100% of the school’s graduates attend a four-year college or university. Over the past five years, Sacred Heart graduates have continued their studies at many diverse institutions – from Notre Dame, Virginia, Vanderbilt and Howard to Colorado, Michigan, SCAD and Johns Hopkins. >>View list of college acceptances in last 5 years. Sacred Heart established its first school, Mater Admirabilis, in the French Quarter in 1867. The Rosary campus underwent three expansions in 1906, 1913, and 1996. In 1998, the expansion included the new academic wing on the corner of Jena and Carondelet Streets. In 2002, the Board of Trustees authorized the purchase of the First Baptist Church property on St. Charles and Napoleon avenues. The Mater Campus opened in the fall of 2005 and is home to the Preschool and Primary School. In 2011, the school opened a new Arts and Athletics Complex on the back square of the Rosary Campus that enhances the arts, athletics, wellness, and co-curricular programs. 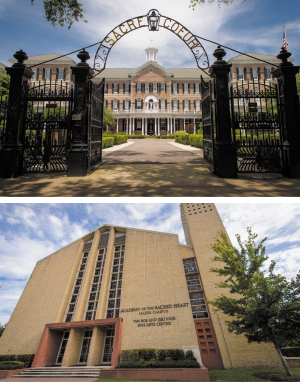 The Rosary campus, which is 125+ years old, stands as a landmark in historic uptown New Orleans. The Upper School operates on a semester basis and utilizes flexible scheduling providing for small group instruction, independent study, and the possibility of taking college courses on nearby campuses or online. To meet graduation requirements, the student is expected to earn a minimum of 28 units of credit. In addition, each student must participate in at least one service project per year, complete at least 50 hours of volunteer work during her junior year, attend yearly retreats and give a senior speech during her final year of high school in order to meet graduation requirements. Students must take a minimum of six credits per year, six courses per semester, five of which must be courses in English, math, science, foreign language or social studies. Any exceptions are only granted by special written permission from the Head of the Upper School. Advanced Placement courses are offered in English Language, English Literature, French Language, Spanish Language, World History, United States History, Government, Biology, Environmental Science, Calculus, and Statistics. Students in these courses are prepared for and required to take Advanced Placement tests. Advanced Placement courses are considered honors courses. Honors courses are marked H on the transcript and are weighted +1 in the GPA. Advanced Placement courses are marked H AP on the transcript and are weighted +1 in the GPA. Students receive formal grades at the end of each semester and progress reports in mid-October and mid-March. A cumulative grade-point average is computed for every student at the end of each academic year. The GPA is based on all courses except PE and clubs. A minimum 3.40 GPA for the year with no grade below B- (except honors courses where no grade may be below C+) is required. Students take the PSAT9, PSAT/NMSQT, PLAN, SAT, SAT Subject Tests, ACT and AP tests. Students have the option of requesting that their PSAT, PLAN, SAT, and ACT scores be included on the transcript. AP scores are always sent separately and typically only to the college they will attend. The Academy of the Sacred Heart student's can receive Microsoft Office Specialist Certification in Word, Excel and Power Point. Students, through these specific computer classes, can earn up to three college credits. What uniforms do Sacred Heart girls wear? Uniforms inspire girls to express themselves in other ways. Upper School Students wear a traditional plaid skirt with a Sacred Heart Oxford blouse or Polo Shirt with top siders or bucks and socks with Sacred Heart logo. Middle School students wear a traditional plaid skirt with a Sacred Heart polo shirt. Lower School students wear plaid jumpers with white Peter Pan collared shirts. Preschool students wear blue puffy-sleeved smocked dresses with monogrammed Peter Pan collar and bloomers. Little Hearts wear green puffy-sleeved smocked dresses with monogrammed Peter Pan collar and bloomers with our youngest group, the one year olds, wearing a green smocked bubble. What is a Sacred Heart Education?